Professional florists give plain flowers new life by using dyes to enrich the original color or to completely give blooms a new shade. Different methods of dyeing help to color coordinate an arrangement or meet the specific needs of a custom order. Preservationists who like keeping blooms in scrapbooks or in display cases often dye their flowers before drying them. The added colorant keeps the flower from fading too much during the drying process. Get the inside scoop on florists’ methods and get rich, intense color for attractive flower arrangements anytime. Florists give flowers a golden touch by using metallic floral sprays on flower petals. Unlike regular spray paint, floral sprays are gentle and will not harm delicate blooms. Other colors like silver, pink, red and blue are popular colors used in floral arranging. Florists load the paint into special air brushing machines and sweep the color over the blooms. After the blooms dry, they are clipped and placed in their destined arrangements. One of the easiest methods for dyeing flowers is to use the absorption method. Florists fill large plastic vases with water along with food coloring. Freshly cut stems rest in the colored water, and, after a few hours of drinking, the flowers display different colors. Designers control the dye results by adjusting the time the flower spends in the water. For example, a deeper purple can be achieved by leaving the flowers in dyed water overnight. The blooms come out of the dye when the the florist sees the desired color. When a floral designer wants to bring color deep into the flower’s petals, he uses the dip method. This is a good way to saturate the flower with a different hue. Fresh-cut flowers get a “bath” in a mixture of water, food coloring and alum. The blooms are placed flower-side-down in the water and given a quick swish. Then the flower is dried in a vase or container for a several hours. Every year, floral companies think of new ways to wow us with flowers. Some florists offer tie-dyed carnations and roses. To get this multi-colored flower, the stem gets split into three sections. 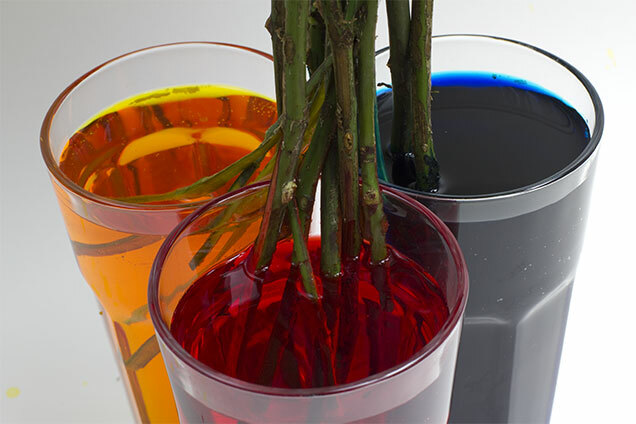 The designer mixes food coloring and water in separate cups or vases, one color per cup. The florist places one section in each cup. After a few hours, the flower takes on a tie-dyed look.